Presto! paper towels and Amazon Essentials clothing are among Amazon’s “top rated” private labels. Source: Amazon. Amazon is aggressively expanding both the number of private label goods it sells and the product categories it offers. Besides dominating online sales, Amazon is the source of over 50 percent of all online product searches, surpassing Google. 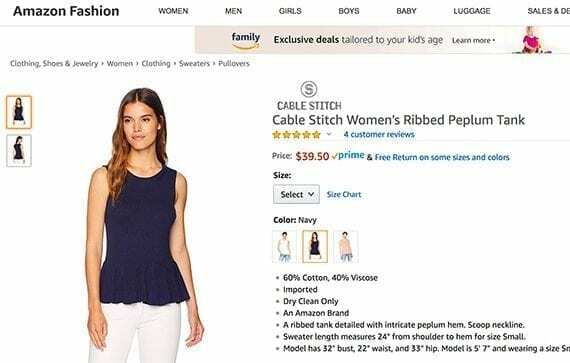 Amazon’s private label strategy is simple: it offers the lowest prices on quality products, often knocking smaller merchants that have only one or two offerings out of the market. Amazon decides which products to offer as private labels by monitoring sales of third-party brands on its marketplace. Once Amazon discovers which third-party products have robust sales, it reviews customer comments and behavior. Then it develops its own private label. If the product gains traction, Amazon will increase production and heighten visibility by advertising the item on its website. Amazon’s data analysis capabilities are unrivaled; the company can design product features and enact pricing strategies with meticulous deliberation. It also can ensure that its products are seen first in site-search results. Amazon first rolled out a private label brand (for batteries) in 2009. For the next five years it added only a few private labels. Eventually Amazon executives began to view private labels as a means to offer quality goods at prices lower than brands that were selling on its marketplace. The term “Our Brands” on Amazon’s websites refers to both its own private labels and “exclusive” brands that are owned by third parties. The exclusive brands do not have the 100 percent refund guarantee available to customers who purchase Amazon private label brands. According to TJI Intel’s Amazon Brand Database, as of December 6, 2018, Amazon offers 132 private label brands and 265 exclusive brands. The numbers have grown rapidly over the past year with at least 60 brands introduced since the beginning of 2017. This year Amazon’s brands garnered enough sales to challenge established brands in categories such as diapers and paper products. Some private label brands are available only to Prime members. For example, Amazon’s Solimo brand is sold via Prime Pantry and offers low-priced items in health, beauty, and groceries. Today Amazon offers more than 100 clothing, shoes, and accessories brands for men, women, and children. Apparel, shoes, and jewelry brands comprise 86 percent of all Amazon’s private label brands. Amazon will overtake Walmart this year as the largest clothing seller in the United States, according to Morgan Stanley. Another growing segment is vitamins and supplements, which the company sells under the Amazon Elements private label. In addition to Whole Foods brands, Amazon offers over 35 private and exclusive food products and 12 furniture lines. More than 20 household goods brands are for sale including the many AmazonBasics products. Eight pet brands for food and accessories are also available. While the greatest number of its private label brands are sold in the United States, Amazon is building its private label portfolio worldwide. AmazonBasics are sold globally on country-specific websites. A smaller selection of private label goods is sold on the Canadian site. In Europe, Amazon has many private label clothing brands that are unique to those markets. Others, like Vedaka, a spice, are sold only in India, as are clothing brands with apparel unique to India. Amazon is now taking on large consumer-packaged brands such as Proctor & Gamble and Kimberly-Clark with its sale of basic household staples. For instance, Amazon sells P&G’s Bounty and Kimberly-Clark’s Viva roll paper towels for $1.54 per 100 sheets. It sells a similar size of its private label brand, Presto!, for $1.28 per 100 sheets. If a consumer searches on Amazon for paper towels, Sponsored Products — keyword-driven, pay-per-click ads — will appear at the top of the page. Major brand leaders have the financial resources to compete with Amazon through Sponsored Products, strategic promotions, and other advertising. Amazon does not expect to overtake the major brands, but it does want to lure away those customers who are not brand-loyal, buying the lowest price items. Smaller brands with a limited product selection and higher costs are a different story. Amazon has the capability to pick off small manufacturers and merchants. These sellers will have a much harder time maintaining market share. For example, since the beginning of the year, Amazon has taken sales away from two small companies that sell diapers. The Amazon brand, Mama Bear, is 33 percent less expensive than The Honest Company diapers and 47 percent less expensive than Bambo Nature diapers. 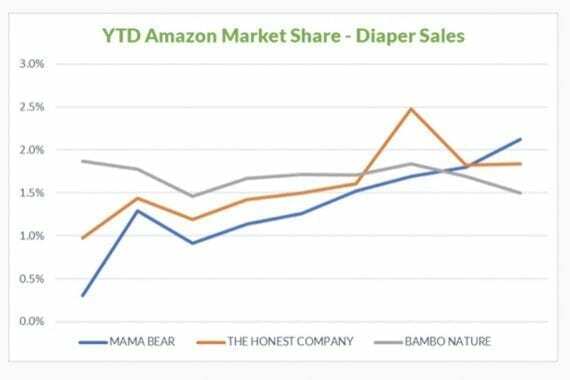 Amazon’s Mama Bear diaper brand now outsells diapers from The Honest Company and Bambo Nature. Source: One Click Retail. Merchants in categories that Amazon targets can make a deal with Amazon and become an exclusive brand — i.e., sell only on Amazon’s websites and use Fulfillment by Amazon. Even some larger merchants are succumbing. GNC, a large, primarily brick-and-mortar supplier of vitamins, supplements, and other health products, suffers from declining revenue and closed 200 stores in 2018. It launched an Amazon exclusive brand called “Challenge by GNC” that consists of performance drinks. Amazon can rank its own products in search results. It also has access to customer behavior that it does not share with its sellers. Amazon’s aggressive push into private-label and exclusive brands may not affect major national companies with many product lines. But as long as Amazon competes on price and can control the placement on its websites, smaller brands will be at a disadvantage.